February 21, 2017 • Allison M. Hermann, Ph.D.
Camille Sims '15 says fate brought her to Cornell. And now it has propelled her to reign as Miss New York and to finish second runner-up in September's Miss America competition. Camille Sims '15 visits the College of Human Ecology Sept. 21. Photo: Mark Vorreuter. As a teen growing up in Atlanta, Georgia, and Chattanooga, Tennessee, Sims volunteered with her mother in soup kitchens, joining the fight against hunger and homelessness. One day, while checking out books in an Atlanta public library, a Cornell recruiter approached her and encouraged her to attend an information session for the College of Human Ecology. There she discovered "how the college represents improving the human condition, solving social problems, and using research as a means to create social justice and to help people live better," she says. "After that, I said, 'Mom, this is it, this is my school! I have to be there!'" Sims recalls. 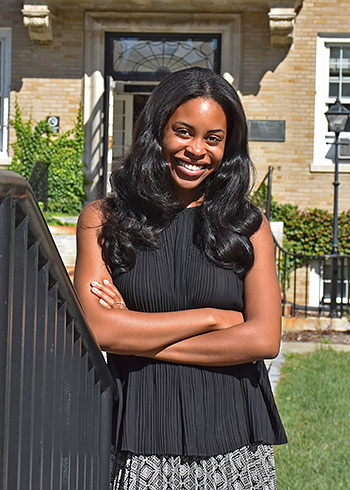 As a freshman and a Meinig Family Cornell National Scholar, Sims sought out Anthony Burrow, assistant professor of human development, whose research on youth purpose and identity she had been tracking since high school. She took "every class that he offered" and conducted research and an independent study through his Purpose and Identity Processes Laboratory. Her project explored how mass incarceration impairs adolescent transitions into adulthood and sparked her to work with Ultimate Re-entry Opportunity of Tompkins County, which supports former inmates. Today, she continues her work on reintegration and other social justice issues as a coordinator with Cornell Cooperative Extension and the Multicultural Resource Center. "I wouldn't be doing the work that I am doing now had it not been for the conversations and experiences in Professor Burrow's classes and lab," Sims says. "Because of her innovative scholarship and passion to contribute to the health of the communities in which she lives, Camille makes a formidable ally to those enduring imprisonment and who will eventually re-enter the community," Burrow says. "Her particular talents are noticeable and effective -- she's the kind of student who demands there always be greater meaning to the assignments in which she engages." Crowned Miss New York in May, Sims is using her title to raise awareness for her platform, Ensuring Wellness and Fostering Food Justice. Sims was drawn to the cause from her early experiences fighting hunger, as well as her work as a Cornell undergraduate at Ithaca's Southside Community Center, where she has helped low-income families with eating healthfully on a budget. Sims credits Cornell's Public Service Center for matching her with local groups as a freshman and her Human Ecology education with making her more effective as an advocate. "I took classes in nutrition and health, human development and nearly enough for a minor in policy analysis and management," Sims says. "I've been able to develop an understanding of the food system from all these perspectives and tie that into my Miss America platform." A jazz singer and songwriter who plans to release her second album this fall, Sims hopes to use her winnings from the Miss New York and Miss America competitions to pay for graduate school, where she plans to continue her research in human development. Ultimately, she hopes to inspire others to engage with their communities and fight for social justice. "Caring is crucial to moving anything forward," says Sims. "For us to move forward as a society, we must ask questions about the food system and start conversations about inequity. There can't be apathy about inequality and social justice if you want to thrive as a community." -- Ted Boscia is director of communications and media for the College of Human Ecology. Sims joins local teens learning how to build computers at an event on the Ithaca Commons hosted by Cornell University and the Southside Community Center during National Week of Making, June 17-23. Photo: provided. Posted in Students in the News and tagged Anthony Burrow, Camille Sims, College of Human Ecology, Cornell University, health, human development, Meinig Family Cornell National Scholar, Miss America, Miss New York, nutrition, public service, Purpose and Identity Processes Lab, social justice on February 21, 2017 by Allison M. Hermann, Ph.D..